His name was Aelius Victor and he was probably from Germania somewhere. He made his goddesses a promise that he’d build them altar and so he did. Now, 2000 years later, it’s been found in excellent condition. 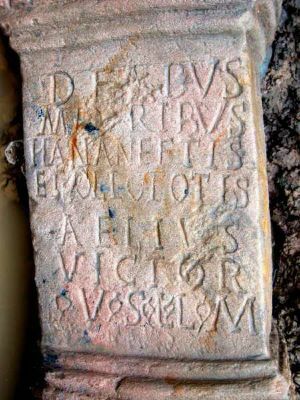 This is only the second time an artifact that actually names a Roman soldier stationed in Manchester has been found. The first time was 400 years ago, and the last time archaeologists found a stone inscription of any kind in the area was 150 years ago. Incidentally, if I had been that farmer, I would have found something to do with the altar besides dumping it, but then again, it wouldn’t be in such great condition today if he had. This entry was posted on Friday, April 11th, 2008 at 6:59 AM	and is filed under Ancient, Treasures. You can follow any responses to this entry through the RSS 2.0 feed. You can skip to the end and leave a response. Pinging is currently not allowed. Oh I love these so human touches in archaeology. How many of us today ever thank our God or gods in writing or with some visible marker? And Aelius Victor chiseled his in STONE. So true. Religious rituals and sacrifices were such a major part of daily life for Roman people. It’s easy to forget about that when you read about military and political history, but these sorts of finds really bring home the realization that everyday people going about their business were constantly in communication with their deities. “I swear to God” wasn’t just a throwaway phrase for them. They really meant it, and they had the pigeons/carvings/burnt offerings to prove it. I love this story. You guys already said why. Clearly you are a man of refined tastes.